(Disclaimer: This posting is based on my own experience flying short-haul flights (2 hours and below), and does not reflect on any airlines' standard procedure nor endorsed by health professionals. Readers are recommended to seek relevant info from the airlines' website or speak with their baby's doctor prior to air travel. These tips may not always work out with other infants and I will not bear responsibility for any outcome after following these tips). Hehe. The truth is, when I do have to fly with a small baby (what more to say with two small babies), I will plan the entire journey with military precision - right from a few days before the journey down to after leaving the airplane! No kidding! Better be safe than be cursed by 100+ passengers upset by my screaming baby, right? Right??? Have baby sling, stroller, well-equipped diaper bag and milk supply - will travel peacefully! I'm writing this post to share my experience with a new mommy, Amy Maria. Good luck traveling with your lil' boy, Amy! When traveling with a small baby, I make sure that both baby & I are truly comfortable throughout the flight. Holding a baby for 2 hours can be tiring. 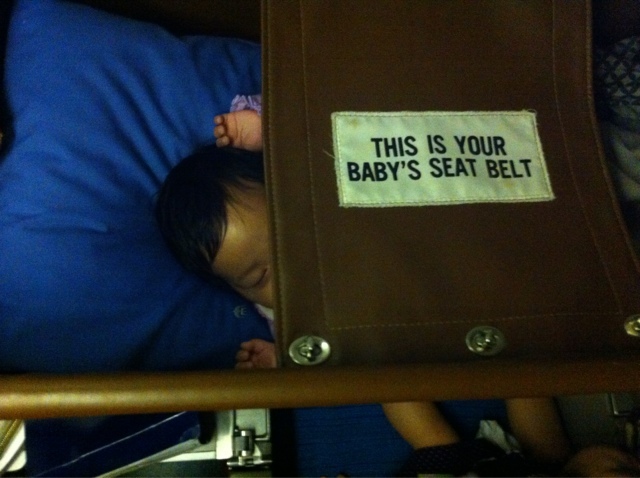 So I try to plan ahead, and get seats where I can utilize the in-flight baby bassinet. Some airlines require you to notify in advance to use this facility. My experience with Malaysia Airlines have been terrific as they have this facility when I booked front seats, and they accommodated my requests whenever I need to let my baby sleep in the bassinet. But what do I do when the seats are already assigned to someone else and I can't use the baby bassinet? This is when a baby sling comes in handy (literary and figuratively speaking). I use baby sling to free my hands and let baby sleep snugly in the sling. Baby sling and nursing cover are truly, man's greatest inventions! Due to safety reason, some airlines don't allow infants younger than 7 days old on-board. Parents must also furnish the infant's birth certificate during check-in, so make sure it is not left at home or kept in checked-in baggage! Tips #4: Pack right, pack light! When you become a new parent, forget about your designer handbag. Now your baby's diaper bag becomes your handbag! Unless of course you are one of the Kardashian sisters who can afford Prada diaper bag (wow, Prada has diaper bag!). I've learnt not to under- or over-estimate packing my baby's bag. It has to carry all the essential stuffs yet light enough and not cramped with all sorts of unnecessary items that I could not find anything when the need arises (and that need can escalate to a shrieking fury as baby gets distressed while mommy desperately rummages through the diaper bag that people may actually think you are digging into the black hole!). For your convenience, Malaysia Airlines allows for an additional 10 kg of purely baby essentials (including a bassinet or carrycot) over and above the free baggage allowance as allotted to an infant’s accompanying adult passenger. 1. Spare clothes (warm clothing, long-sleeved baby rompers are ideal), in case baby poops or spits up milk all over her dress / shirt. Only a pair is necessary for short travel. 2. A small towel or baby bib - to wipe spit up milk or burp baby. 3. A new pack of baby wet wipes - I make sure there are still plenty before the journey. 4. 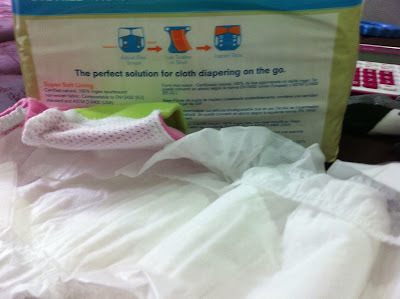 Diapers - Khayla is currently using disposable diapers while Khadeeja is using cloth diapers. For Khayla, I normally pack 3 pieces of disposable diapers in the bag (theoretically, one each for change at the departure airport, during the flight and at the arrival airport). Unless your baby is having diarrhea or you are experiencing terrible delays or in a flight of more than 5 hours, I reckon you won't need all 3 diapers. At the most, you will use only one diaper. For Khadeeja, I will bring an extra diaper, and additional 2 soakers. However, since discovering biodegradable soakers that can be disposed of without worrying about the environmental impact, I've gone hybrid and gotten one of those biodegradable soakers to use with CD shell (that way I don't need to bring a lot of CDs, or worry about washing and drying them while on the go. Pretty cool, huh?). I use Grovia biodegradable soakers (which costs me RM35.90 for 30 pieces) with Lunatots CD, and once soiled, I just throw away the soakers and re-use the outer shell. You can purchase it at any leading baby store. 5. Diaper changing mat / baby blanket - if your diaper bag doesn't come with diaper changing mat, then you can also use your baby blanket provided it is wet-proof. 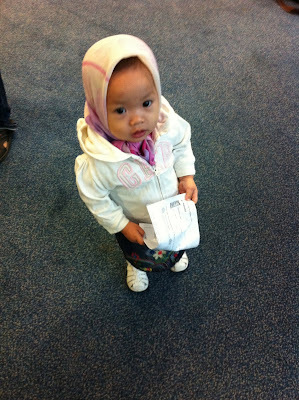 Some infants like to be wrapped in baby blanket, so remember to bring it along as well. 7. 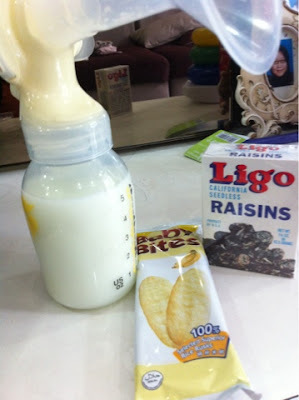 A bottle of milk - when I have to travel alone with my baby, I prefer the convenience of bottle feeding EBM to my baby. I would pump milk before leaving home and store it in the baby bottle (so no hassle of transferring from storage bottle to baby bottle). EBM can stand in room temperature for up to 5 hours so you don't have to chill or freeze it before. Just keep away from sunlight and it is good to go. You can also ask for help from the stewardess to warm up the milk but be sure to provide specific instruction i.e. what temperature of water to use to heat up the milk (Once, I asked one of the flight crew to warm up the chilled milk and when he came back, the milk was too hot to consume straightaway and all nutrients destroyed!). Once Khayla started on formula, I pack the formula in small air-tight container and prepare the formula on board. If you are flying MAS, you don't have to bring hot water flask as everything is provided. Heck, even if you forget the formula, they have 'a limited quantity of baby formula' for your baby's convenience. However, if you are flying AirAsia, I highly recommend you come fully prepared. 8. Nursing cover - This comes in handy when I don't have the time to pump in advance and can nurse my baby on board. Additional tips - get a window seat for more privacy, and don't be shy to request for a pillow to support your baby. When not in use, nursing cover can double as baby blanket so you don't have to bring both at the same time. 9. 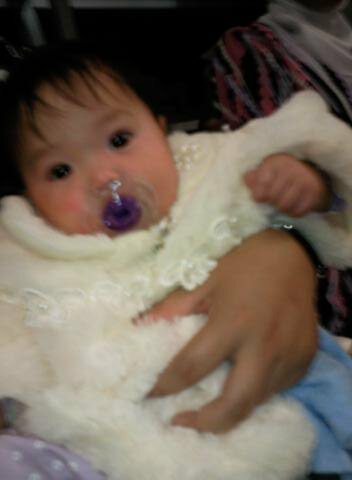 Pacifier - pacifiers are Khayla's and my best friend whenever we had to travel last time (now she has outgrown the pacifier, thank God). A pacifier can help balance the air pressure inside baby's ears, keep them soothed and help them sleep better. To avoid accidentally dropping it on the floor, clip it using pacifier clip to your baby's front shirt. Some parents oppose to the use of pacifier as many baby experts say that it is not hygienic, disrupt with baby's appetite for milk, delay speech development and it will be hard to take it away once baby has become attached to it. My experience with Khayla using the pacifier proved that it is not necessarily true, because pacifiers are only used at certain times (helping her to fall asleep, during flight take-off and landing, during long distance car trips, distract her from teething pain, etc.). 10. Baby's medicines and oral syringe - it's better to be prepared than be sorry. So wherever we travel, we will also pack the kids' medicines and oral syringe to administer the medicine. It's also good practise to have a small stash of band-aids, hand sanitizer and Dettol in your baby's diaper bag. 11. Baby food - dry finger food like baby biscuits or cut fruits are easier to store, less messy and easier to clean up afterwards compared to rice cereal or puree. Yes, it is less nutritious but considering that a spoonful of that rice cereal could end up on somebody else's hair or clothes (babies can be notorious during meal times! ), it's best to opt for something less messy. 12. Baby teether - for teething babies. They get more miserable when they are confined to the plane seat and not allowed to crawl anywhere and bite everything! Optional item - breast pump, accessories and storage bottles. I pack these separately but carry them as hand luggage (I'm using Medela Freestyle which I stow in my handbag to minimize hang luggage). Normally, I dress my kids in layers that can be removed according to the climate - loose, comfortable clothing that is easy to take off whenever I need to change their diapers (e.g. rompers with not so many complicated buttons or dress with underwear); jacket or cardigans that can be taken off and stash in the diaper bag when it gets too warm; socks and comfortable shoes. Don't go for one-sies that you have to unbutton numerous buttons to get your baby out of it. Leggings are cute and warm but when you are changing a wriggling baby in the plane's toilet amidst air turbulent, it can be unbelievably exasperating to put back on! I have a confession - I am hopelessly over-dependent on a stroller. Maybe because of age or the lack of calcium, I get backache easily when carrying my baby for long period. Khayla also gets extremely grouchy and uncooperative if we forced her to walk. 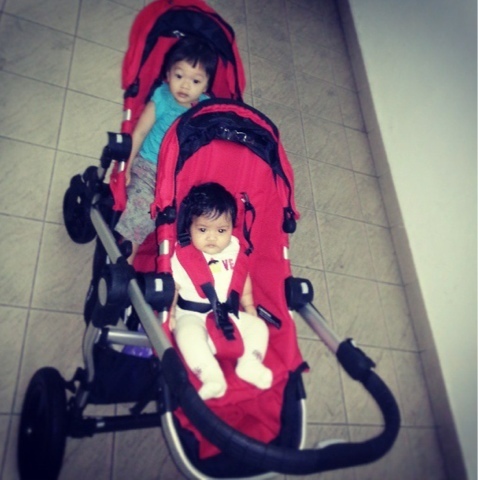 I depend on strollers so much that I even bought a tandem stroller - Babyjogger City Select that can switch from single to double stroller whenever I go out with both Khayla and Khadeeja! So even when I'm flying, I will bring a lightweight buggy knowing Khayla only too well. Both MAS and AirAsia allow parents to check-in stroller and use it up to before boarding the flight. When flying MAS, I had to fill in a simple form which they will attach to the stroller tag for identification when collecting the stroller upon arrival. AA doesn't require any form-filling though. Both airlines require parents to close the stroller before they store it in the cargo compartment. Of course, we never know when accidents can happen but being prepared can be a life-and-death decision. If ever we were involved in accidents, I would like doctors to know my baby's age, what kind of immunization my baby had taken, her blood type, if she has any allergic reactions to certain medications before, etc. All these are recorded in her medical book so make sure to bring it anywhere you and your baby go. I'm referring to domestic travel between Peninsular and East Malaysia. Peninsular Malaysia citizens bringing their baby to East Malaysia (you can look up info from the Immigration Department website), are no longer required to fill up any form or produce passport when they fly into Sarawak or Sabah. They are however issued with a white slip (IMM 114) as alternative to passport, which they must keep and show to the immigration officer when flying out of the state. Likewise, parents just have to show baby's birth certificate at the airport immigration checkpoint when traveling with infant. Still, the 90-day social pass thing-y is still enforced on both parents and kids. Parents / parent of Sarawak origin (like myself) don't have to worry about the grace period as their kid will be accorded same status as any other Sarawakians. Initially I was worried because both my kids' birth registration number don't carry Sarawak registration number (13) since they are born in KL. Turned out no matter where they were born as long as one of the parent is Sarawakian, the system will recognise them as Sarawakian as well. Phew! Babies are predictable creatures and they love routines. When their routines are interrupted, that's when they get ill-tempered and fussy. So if you are flying in the afternoon, start to encourage your baby to sleep around the time you'll be catching your flight a few days in advance so it will be easier to put her to sleep on D-day. 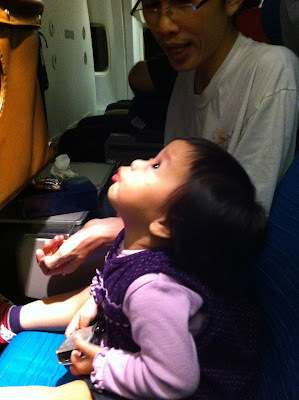 Night travels are more relaxed for me because it takes little effort to put the kids to sleep after an exhausting day. Another tactic I used is letting my kids stay up as long as they like, and then waking them up early. This way, they can catch up on sleep during the flight. But there's also a risk to this strategy - baby can also get so high-strung from lack of sleep and unfamiliar environment and go into tantrum mode before finally winding down (which is more often than not, by the time the journey ends). I also try my best not to let them fall asleep before and during the flight take-off or in other words - I save the nap only for during the flight! Remember. Nothing is more harrowing than trying to pacify a bad-tempered, tired and frustrated baby when everyone around you is giving you annoyed looks. Tips #10: Don't be shy to ask for help from strangers! Really, Malaysian people are a bunch of nice people who would not mind lending a helping hand, ONLY IF you ask nicely. Most of the time, people are shy of offering their help because of the Asian culture of saving your face ('maybe I'll embarrass her more if I offered my help when she doesn't ask for it?'). I am never a shy one when it comes to asking for help when I truly need it! Tips yang berguna. Thanx Karni. Aku belum ada experience untuk travel tanpa suami..kui kui kui..driving or flying..belum sedia sebab RAs sangat nakal. Based on exp, driving & flying pun sama je apa nak prepare. Yang penting diapers bag tu complete & aku comfortable guna beg sandang belakang. Aku agree dengan hang travel pagi untuk orang ada anak kecik adalah sangat tak baik. Mesti terlambat punya. Hari tu waktu nak ke Kuching pun aku nyaris tertinggal flight sebab tak sedar bangun awal pagi. Tapi apapun aku bersyukur sebab 2 orang budak tu dah terbiasa duduk dalam car seat so takde la aku risau dieorg kacau aku masa driving. Setakat menangis tu, aku dah terbiasa, buat derk je la. Hehe. Salam. hi sis! Ohh sgt2 bersyukur jumpe akhirnye blog sis ni yg shared details tips travel with kids without en. Husband..omg lg 2 weeks saya kan ke Labuan dgn my kids- 3y boy n 1y++ girl. Husband keja d Labuan. Hopefully by follow sis punya tips ni kan Bantu saya nanti. Huhuu x Lena tidur lately ni dok pikir mcm2. Btw saya naik MAS. Hope semuanya Akan ok. Tq again sis!